Cocktails, tacos and popcorn are all cheap and cheerful patio snacks that won’t break the bank. National on 8th. Photograph courtesy of National on 8th. On Saturdays, Sundays and holidays, Alforno serves its mimosas, Bellinis and Caesars for $5 a glass. Or, dip into the limoncello for $6 anytime. On Tuesdays, red, white and rosé wine is $1 per ounce. Your $6 glass of wine is best sipped on Cannibale’s cozy, heated patio anytime the snow’s not falling. Cibo serves up pizzas for $5 and wine and beer for $4 during its afternoon and late-night happy hour. Get the deal from 3 to 5 p.m. Monday to Saturday, after 9.pm. Monday to Thursday and after 10 p.m. Friday and Saturday. Container Bar has a bar snacks menu where everything costs between $5 and $7. The six dollars and under items include bacon strips with maple syrup, duck fat potato chips, salted chicken skin, veggies with garlic lemon dip, green chickpea dip with crostini, and spiced popcorn. Before 7 p.m. and after 9 p.m. Sunday to Thursday, you can get $3 tacos and $5.50 cocktails at this popular Latin street food spot. 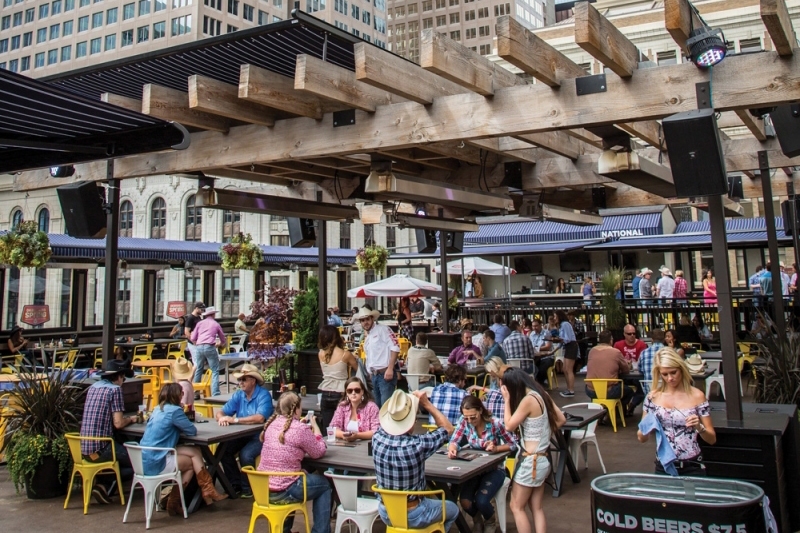 National on 8th’s patio happy hour happens all day Mondays and from 3 p.m. to 6 p.m. Tuesday to Sunday. It includes $1.50 oysters and beer is 25 cents an ounce. This friendly neighbourhood pub in the Beltline does a personal size plate of pulled pork nachos for just $5 during its happy hour on weekdays from 2 to 6 p.m. Also on the $5 menu are pints of Royal Lager and Tool Shed’s Cow Killa, tall cans of Village Brewery’s Reservoir Pigs Pilsner, domestic bottles, highballs and house wine. From Tuesday to Saturday from 4 p.m. to 6 p.m., Raw Bar serves its happy hour menu that includes half-price small plates and $5 house wine, draft beer and classic cocktails. On Fridays from 4 to 7 p.m. at the Hotel Arts pool, you can get $1 oysters and sip on glasses of prosecco for $4.99. This article was last updated on July 26, 2018.